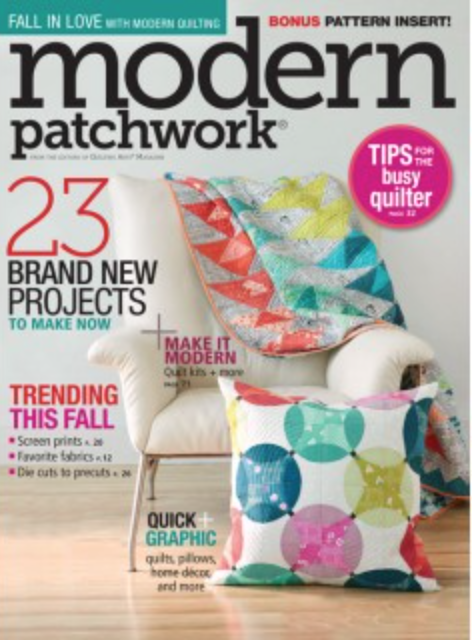 As many of you know, I've been making quilts pretty much since forever. I started my first quilt in 1977 when I was a 24 year-old stay-at-home mom. After borrowing two quilting books from the library (so few were available then! ), I cut into our daughter's outgrown baby clothes - with scissors! - and began hand-piecing. 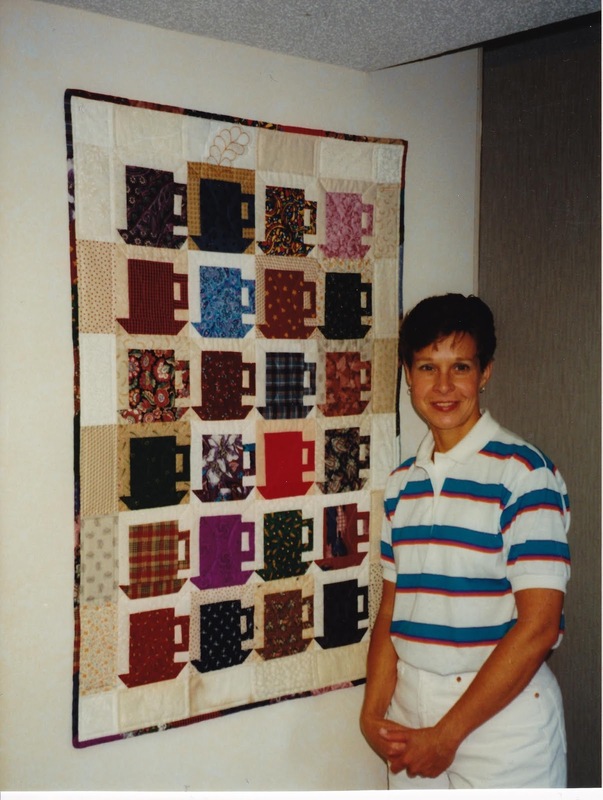 I continued to dabble in quiltmaking, but it wasn't until the early 1990s that I began making quilts in earnest. In 1994 I was one of the early World Wide Web users through my job at Drake University in Des Moines. During breaks and lunch, I visited online chat rooms, and made the unexpected but exciting discovery that I could get to know quilters from all over the world! 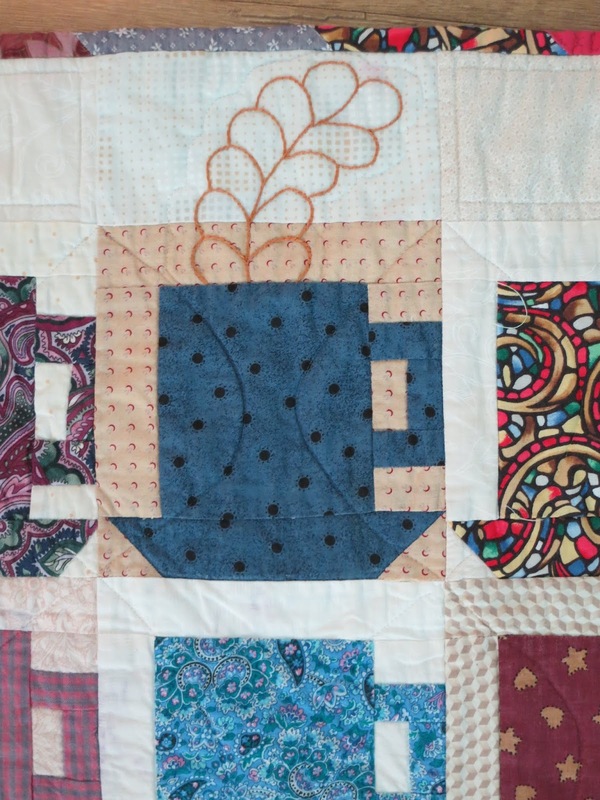 Our quilting chat room was Kaffee Klatch. Interestingly, many of those quilters also worked at universities and colleges. You might imagine how exciting it was to actually meet in person, one of the first quilters I met in the chat room! 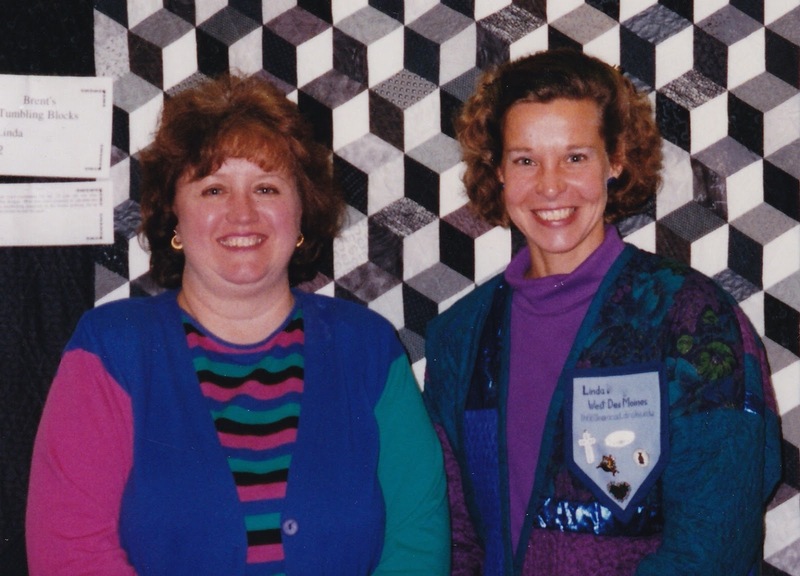 That happened in 1995, when Deb from Creighton University (Omaha, Nebraska) visited Des Moines for our quilt show. This is Deb and me when we met for the first time at that show. 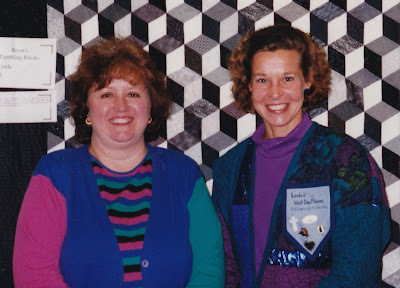 We stood in front of one of my quilts, a Tumbling Blocks quilt I'd made for my then 16 year-old son. That Kaffee Klatch chat room is where Deb and I came to know one another better, swapping quiltmaking advice, and deciding to do a block swap. So, it was with great pride that I machine pieced coffee mug blocks to mail and exchange with my online friends. 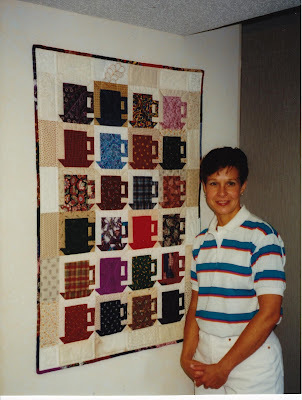 This is the "Coffee Time"quilt I made in 1996 that hung in our kitchen for many years. And yep, that's me about 20 years ago. I came across the Coffee Time quilt that has been stored in a pillowcase for at least eight years. It's looking quite the worse for wear. You can clearly see what has happened. Colors have bled! Presumably this occurred when the quilt was folded and fabrics were pressed on top of one another. The stain on the left is really telling because it's actually a checked print stain! It's exactly the same print as the faded fabric in the mug! I'm deducing that these fabrics, made in the mid-1990s, just aren't as colorfast as those we use today. I was so proud to have thought to embroider a "steam" feather coming from one mug. It's also stained blue from some other print. 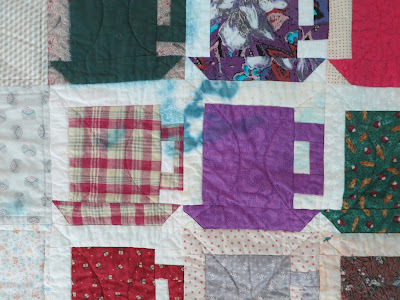 The quilt back was pieced with fabric strips where stains can also clearly be seen. 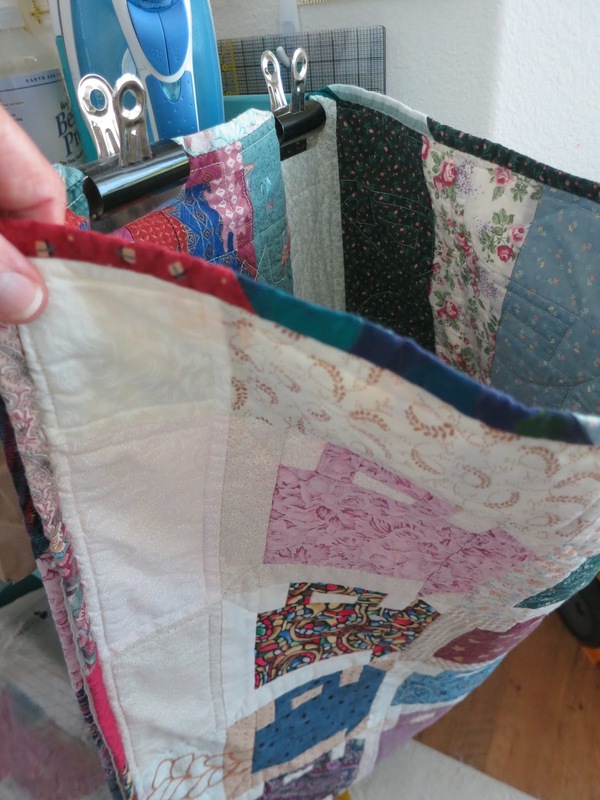 This blog post is meant not only to share what can happen to a 23 year-old quilt made with old fabrics, but to document what I shared with these quilts - a unique, then-new, online relationship! Quilters worked at Creighton University (Omaha, Nebraska), the University of North Carolina - Chapel Hill, and Drake University. To this day, Deb remains a very special friend with whom I often FaceTime. This is what I've done with the quilt. I sewed three sides together and am tossing fabrics bits, threads, and batting pieces into it. When it's full I'll sew closed the fourth side and donate it to an area shelter for cats and dogs. Pet beds are a great way to recycle all the fibers from a sewing room. Such a walk back in time and such good memories I'm sure! 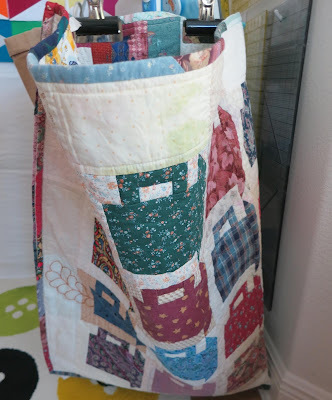 Great use of a quilt that has seen better days and I know all the fur babies will appreciate your donation! It was such a pleasure meeting you in person after all our online chats. Born in the same month and year, but I'm a bit older. I'm so glad we met and have remained good friends to this day. What a wonderful story Linda! I'm sure all your block swap friends will approve of this treasured quilt's new life! And the lucky dog too! You were adorable back then. The 80's and 90's were interesting years. Huge shorts waist high..... lol. This is an amazing and sweet memory. This is good that you are filling the old quilt. You have pictures of it, and now it is time to let it go.. That is okay in my heart too. So fun to see into your early quilting life just a little. 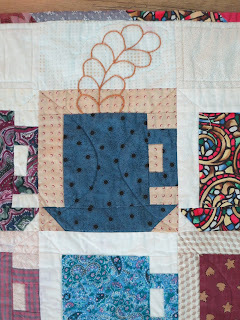 Also interesting to see what happened to the coffee cup quilt over time. You've certainly made the best of it. I'm currently sorting and cutting some really old florals (some as old as 20yrs) from my stash. Plan to make a few small quilts and then divest myself of the rest of the fabric. While sorting I realized some of the fabric was from big box stores. Stiff feeling etc. That all got boxed up to donate to a local art thrift shop. Oh Linda, that is a fabulous idea, keep the love moving forward!!! I so enjoy hearing about your life stories, thank you so much for sharing!! Linda, These memories remembers me how we met! Such a fun story and a lovely walk down memory lane. I started quilting in 1973, trying to make a bedspread (!) for our bedroom. Oh, my--how things change!